This was a rough week for nearly every asset class, with only cotton (up 1.3%) and long term bonds (up 0.3%) showing any gains. 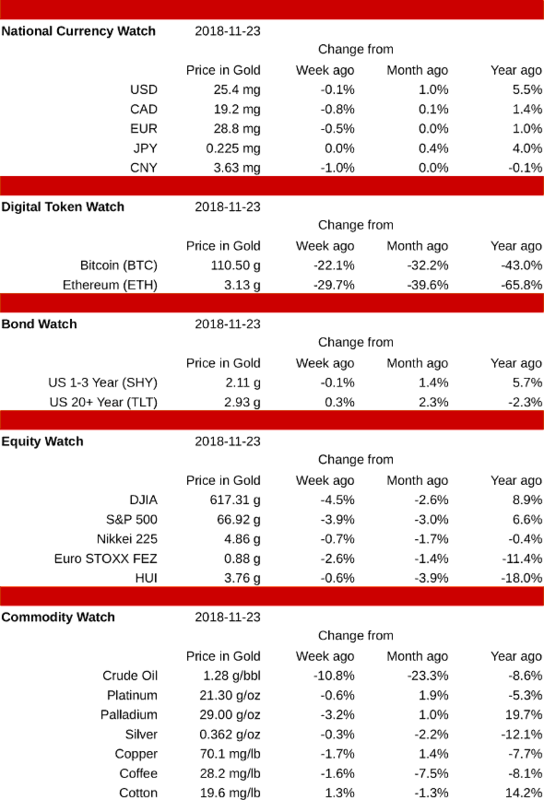 The brunt of the selling was once again cryptocurrencies, as ETH plunged 29.7% and BTC fell 22.1%. Stocks and commodities weren't spared: crude oil dropped 10.8% and the DJIA fell 4.5%. The Japanese Yen was unchanged, but all other national currencies were lower, led by the Chinese Yuan which fell 1.0%. The US Dollar gave up only 0.1%, as did its short term bonds, and long term bonds gained 0.3%, showing their "safe haven" status. Cryptocurrencies were slaughtered again this week, as Ethereum dropped a stunning 29.7%, and Bitcoin fell 22.1% to close at 110.5 grams. Both are now making new lows for the year, but so far Bitcoin remains above its exponential uptrend that started in 2015 and doubles every 18 months. A drop to about 80 grams will bring it to a retest of that support line. Stocks were all lower this week, with large cap US indexes leading the way. The Dow Jones Industrials fell 4.5% and the S&P 500 dropped 3.9%. Least affected were the gold stocks, off 0.6%, and the Japanese Nikkei index, which gave back 0.7%. Commodities were mostly lower, but cotton was the shining exception, gaining 1.3%. After the cryptos, crude oil was the worst performing asset of the week, dropping 10.8%. Palladium fell 3.2%, and copper gave up 1.7%. Silver did relatively well, falling just 0.3%.